Today the PRICE OF GOLD ended Comex down $1.30 0.11 Percent at $1,157.70, but ended the day at $1,164. SILVER rose 12.3 cents (0.8%) to $15.468 at Comex close. In the aftermarket, I had to pay $15.65 to buy silver, so that Comex close smells a little gamey. Sounds like somebody doesn’t want to go home for the weekend without some silver and gold. 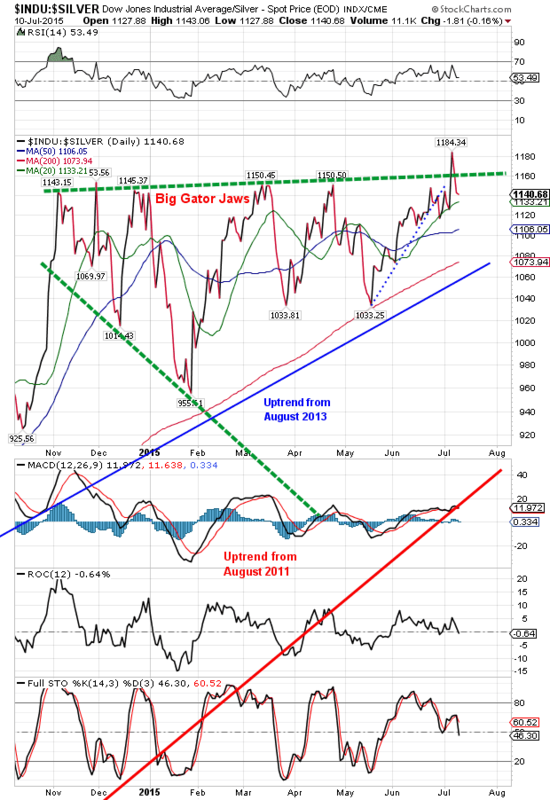 One item I left out of my discussion of the Dow in Gold and Dow in Silver above. They address my apprehension that silver and gold prices might plunge to the $1,000 or $8.00 some analysts keep thumping for. If stocks moved higher, then the DiG and DiS could only maintain that top Gator Jaw if metals, too, moved up in step with stocks. Being stalled at their highs for eight months whispers loudly that stocks aren’t going much higher, at least, not higher against silver and gold. Mathematically it’s also possible that stocks might drop while metals drop, too, but then I’ll play the metals seasonal low card. That seems to halt that possibility. 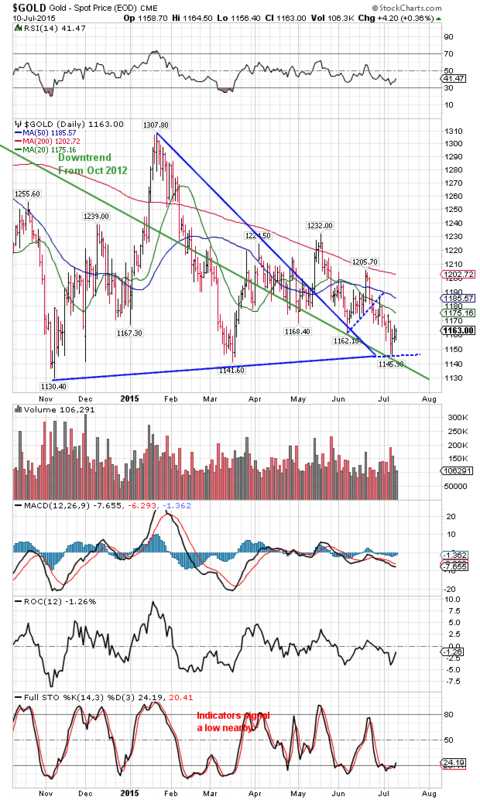 The PRICE OF GOLD this week traded down to trendlines I’ve been watching, especially the uptrend from the November low, and successfully bounced off. However, that’s like saying, I’m glad I didn’t have much money in it when they stole my wallet. Gold needs positive proof of a turnaround, some sign, but it has not yet given that. Buying here you’re guessing we’ve seen the low, but you’re only guessing. Chart on the right. 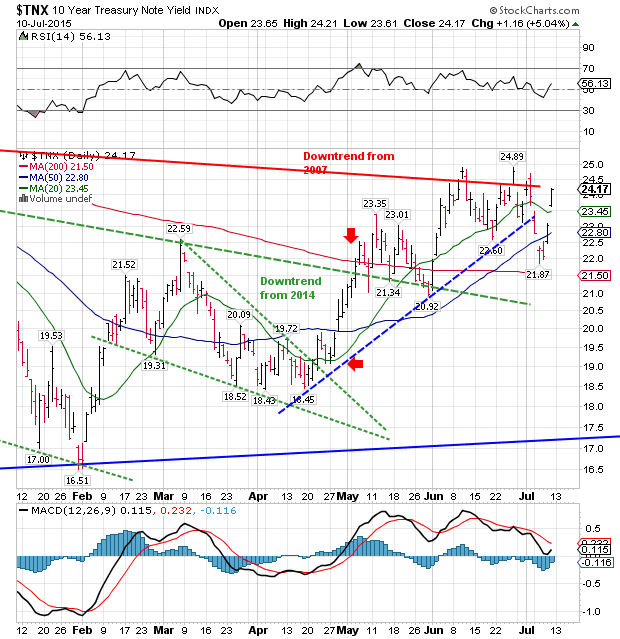 The SILVER PRICE actually posted a key reversal followed by two days’ higher closes. 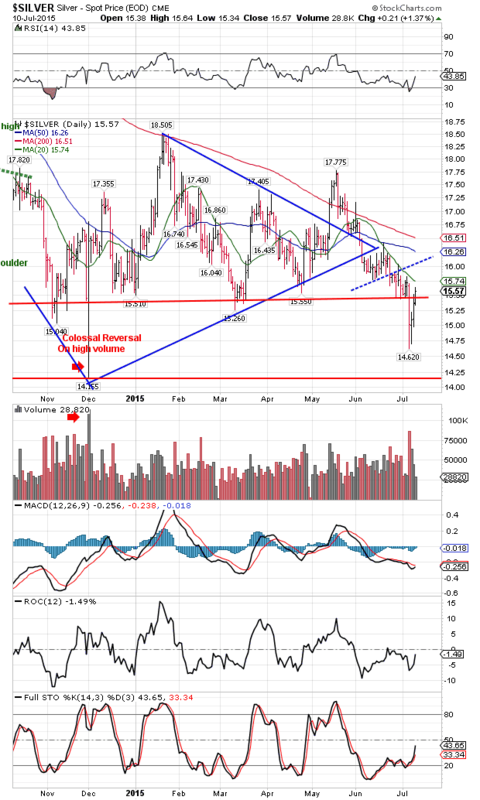 This implies a rally of some magnitude, yet silver has not yet crossed the rally tripwire (the 20 DMA). 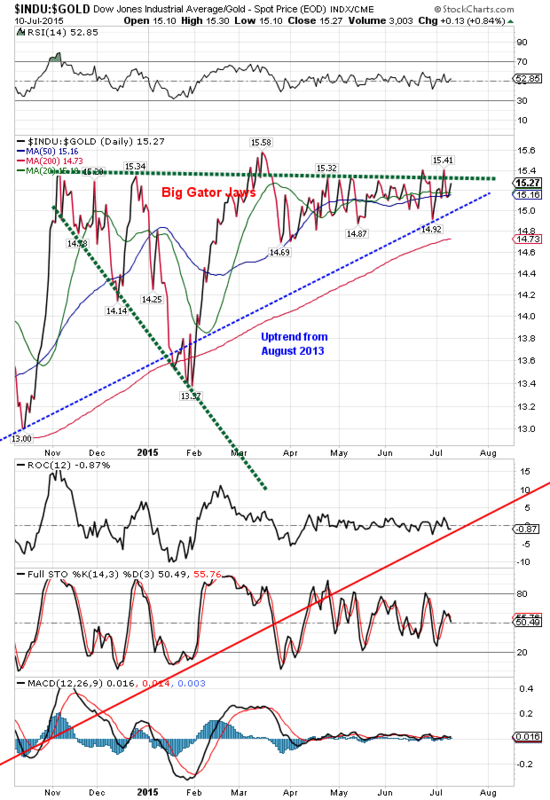 Momentum and trend indicators are turning up. Next week could be a higher week — much higher. If so, it will start higher on Monday. I suspect I see the invisible hand of Bogusness in this week’s closes. At Comex close both silver and gold prices were down slightly for the week, but in the aftermarket they were up strongly, slightly higher than last week’s closes. Nevertheless, the tape is painted with down weeks for both. Likewise the Dow ended with an “up week” by 30.30 points after spending most of the week taking on water and running the bilge pumps. S&P500 finished flat. US dollar index was strong as a garlic milkshake all week, so had to be tempered on Friday. Those Nice Government Men must think we all fell off a turnip truck. Let me brush these hayseeds off my shoulder. The media, who report “all the news that fits,” tell us today that stocks rose on hopes of a European deal on Greece’s debt this weekend. If so, that’s the triumph of hope over experience, as Dr. Johnson said of a man’s remarrying soon after the death of a wife to whom he had been unhappily married. The Greeks have the Euros over a barrel now. The Euros over the past few years have shifted the debt from the banks to the taxpayers, and now the taxpayers, through their governments, will take the hit if Greece defaults. Not good for politicians when taxpayers find out how they’ve been shafted. Anyhow, the Dow rose 211.79 (1.21%) to 17,760.41 while the S&P500 climbed 25.31 (1.48%) to 2,076.52. Today’s closes bring both averages back above their 200 DMAs. I talked to my friend Al Thomas today (www.mutualfundmagic.com), author of “If It Doesn’t Go Up, Don’t Buy It.” Al is one of those men you listen carefully to because his knowledge comes from experience. He is expecting one last rise in stocks, and reminded me that the sell signal comes when the market moves through a DOWNTRENDING 200 DMA. The stock index’s 200 DMAs are almost flat, but still rising and not yet falling. Yes, yes, Al’s book most certainly is worth buying, reading, and studying. Someone asked me a question today that revealed I haven’t done my explaining job very well. The formation I call “Gator Jaws” in the Dow in Gold and Dow in Silver is what most folks, who lack color and imagination, call a “broadening top” or “megaphone” pattern. In this pattern a market stalls, moving sideways with higher (or flat) highs and lower lows. It is not able to push through the old highs and advance, and suffers deeper lows. Eventually it breaks out downward, never to recover. That’s what I’ve been watching in the Dow in Gold and Dow in Silver, although these two are very irregular examples of a broadening top. Both charts have been unable to penetrate that top Gator Jaw and advance. Now their 200 DMAs are pushing up on them, leaving little room to fall without strong consequences. Dow in Gold ended today up 0.84% at G$315.66 gold dollars (15.27 troy ounces). Dow in Silver lost 0.16% today to end at $1,474.82 silver dollars (1,140.68 oz). That comes after the DiS pierced the upper Jaw Tuesday with a rise to$1,531.27 silver dollars (1,184.34 oz), a new high punching through that line. It just as quickly fell back within the gator jaws. Why am I so concerned with this? Because the Dow in Gold and Dow in Silver are the most reliable indicator for that shift in investor mood from confidence to lack of confidence in the financial system. And that, dear friends, is what drives silver and gold up. So when the DiG and DiS confirm they have turned down and resumed the bear market for stocks against metals that began in 1999 and 2001, we can be sure that gold and silver nominal prices have turned up. And, of course, pinpoint the time to swap stocks for silver and gold. You there, in the back! I see you dozing! Sit up, pay attention. I’m not a politician, so I have no easy answers. 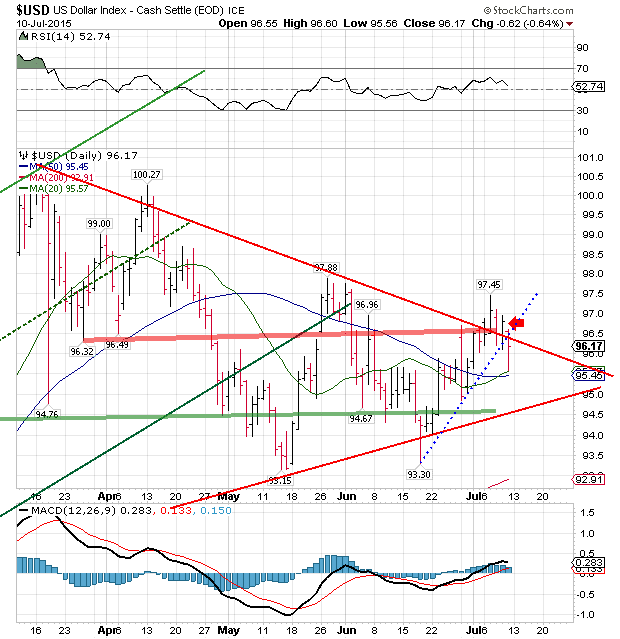 After breaking out upside this week out of an even-sided triangle, the US dollar index fell back into the triangle today, down 62 basis points (0.64%) to 96.17. That breaks the uptrend for the interim, but does that mean this week’s breakout was a fakeout caused by safe haven buying over Greece? Maybe, or maybe NGM manipulating rates. Either way, it’s too soon to count the dollar’s rally dead. I would need to close below 93.30 (last low) to call that. Chart’s on the right. Euro rose 1.16% to $1.1160. That leaves it still broken down out of an even sided triangle and looking nasty. The Yen’s masters slapped it winded today, down 1.21% to 81.42 and once again below that range that held it from December to May. Bond yields gapped up today, whereas earlier in the week they gapped down. This is some kind of volatility, with the yield closing above the 20 DMA. Since bond prices fall when yields rise, this implies those flighty investors who fled euros and other investments because of Greece had backbone transplants last night. I’m sorry, I just don’t buy it. ‘Tain’t nat’ral. Charts on the left. Both Copper and Crude appear to have turned up after vicious drops earlier in the week. Whether that is lasting or temporary is not yet clear.